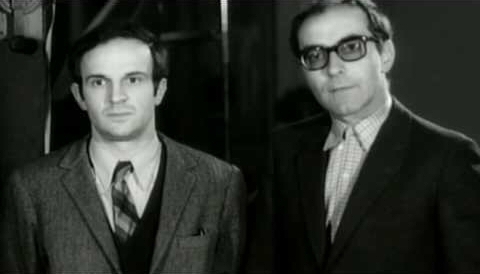 Let's get it out of the way: Godard and Truffaut are the two most influential film critics of all-time and one could easily make the argument that they are the two most influential critics of any kind, period. They aggressively pursued a mission to control the canon of a relatively young medium and their definitions of what constitutes cinematic art more or less stand untouched to this day. It's hard to conceive of world in which Alfred Hitchcock and Nicholas Ray were not considered geniuses, in which the kind of popular entertainment created by Frank Tashlin and Charlie Chaplin was rountinely dismissed by serious scholars and looked down upon by critical minds, a world where Fritz Lang's films noir and spy movies were seen as secondary, almost embarrassing facets in the career of an Artist capable of so much more - but without Godard and Truffaut shaping the critical outlook, that's how things would be. Along with their mentor Andre Bazin and the other critics of the 1950's French film journal Cahiers du Cinema, Godard and Truffaut specifically undertook the job of transforming the notion of what was considered art; building a new foundation of cinema philosophy on which everything from Rainer Werner Fassbinder's devastatingly baroque socio-political spires to Quentin Tarantino's reappropriated trash monuments could be constructed. They also each picked a different film by Nicholas Ray (Bigger than Life for Truffaut and Bitter Victory for Godard) as well as one from Sacha Guitry each (Assassins et Voleurs for Truffaut and Les Trois font la Paire for J.L.G.) That means they sync up on effectively 60% of their selections. Godard has two film from Frank Tashlin which makes my fuzzy math for the correlation percentage even fuzzier - at any rate, as anyone could've guessed, they're on the same wavelength. There were three films I had never heard of: Pennywhistle Blues and the two from a director I know nothing about, the aforementioned Sacha Guitry's Assassions et Voleuers and Les Trois font la paire. Interesting how the authors' tastes really have determined auteur status in the decades since: only Donald Swanson (director of Pennywhistle Blues) doesn't have an auteurist rep of any kind. Sacha Guitry is the only other obscure filmmaker - it's basically all canonized heavy-hitters like Hitchcock, Kazan and Chaplin. Virtually every film on here has a notable pedigree and there are several consensus classics on both lists. I love Buñuel's The Criminal Life of Archibaldo de la Cruz, but I didn't expect to see it on here because (as I've discussed before) it's not one of Buñuel's better known films. It's pretty striking that it's on both filmmakers' lists, all the more striking because I wouldn't have pegged either one as a Buñuel fan. Even more shocking, I never would've guessed that Godard is a Bergman fan - that's easily the biggest stunner on here. Additionally, according to every source I could find, Sawdust and Tinsel was made in 1953 - I know the international release dates for these choices make things murkry, but 4 year-old movie popping up here is a bit of a surprise in and of itself. Before seeing these lists I had no idea who Sacha Guitry was - so his strong showing raised my eyebrow (á la Dwayne Johnson in pre-People's Elbow mode delivery.) Tracking down his films proved to be impossible, so I was actively curious about him as I began putting this together. I was able to see a bit of Assassins et Voluers by disreputable, internet-y means and both filmmakers wrote a bit about him for Cahiers du Cinema, so I'll still discuss the films even if I was unable to find complete versions. 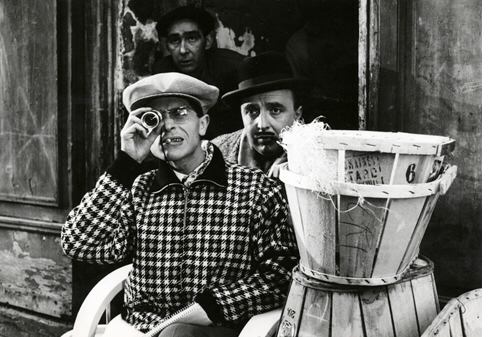 It's fascinating that both Truffaut and Godard love his work, but their enthusiasm really failed to impact Guitry's lasting reputation - for so many other directors on the list, the exact opposite is true: their passionate advocacy on behalf of Charlie Chaplin, Frank Tashlin, Fritz Lang and Nicholas Ray secured those filmmakers' places in cinema history. Sait-on Jamais... has a bad reputation these days and is all but forgotten to everyone but hardened cinephiles. Director Roger Vadim is mainly famous at this point for the women he bedded (an in-their-prime Brigitte Bardot and Jane Fonda, etc.) and being the impresario of faux-classy 60's Euro-sleaze like ...And God Created Woman (the man loves his ellipses in titles), but in 1957, Vadim was still just a promising neophyte, so it's inclusion isn't necessarily so puzzling after a bit of reflection. Still, I think if given 500 guesses, I never would've come up with Sait-On Jamais... appearing on either list. Two westerns, Forty Guns by Sam Fuller and The Searchers by John Ford are pointedly absent. Fuller was a favorite of the New Wavers (he famously camoes in Godard's Pierrot le Fou) and Forty Guns is the type of nutty, stylistically distinctive genre film that they were always falling all over themselves to praise. Ford is less of a Cahiers favorite, but still... it's The Searchers. After looking it up, I discovered Truffuat dismissed it as something that "bores us," which I agree with but it still surprises me. Two war films, Men in War by Anthony Mann and Attack! by Robert Aldrich, are similarly omitted, which is a surprise considering how Truffaut rates them (in his Truffaut-ish way) in The Films in My Life. Also Truffaut's 1956 list features three Aldrich films, so to skip a great one like Attack! is particularly strange. Men in War is a personal favorite of mine and I had assumed Truffaut and Godard shared both my good taste and critical brilliance. I guess not. Overall, the release date issue mucks with things a bit - I'm not sure what their options were well enough to really have concrete expectations. They don't seem to be working from any clear cut-off dates, so the lists consist mainly of films from 1956 & 1957... but The Criminal Life of Archibaldo de la Cruz was originally released in Mexico 1955 and, as I mentioned, Sawdust and Tinsel came out in Sweden in 1953. The auteur argument in action! To a certain extent, writing about these lists is going to involve rehashing a lot of familiar ideas, so I'll try to get as much of it out of the way at the beginning as is possible. As I've been over extensively, Nicholas Ray is one of the centerpieces in Truffaut's explication of the auteur thoery. The idea of auteurism originated with Cahiers critic Alexandre Astruc, but Andre Bazin and Truffaut are the ones who made it gospel - it's a deceptively simple idea: some filmmakers have a signature which can be seen in all their films, regardless of what genre or actor or producer or script they're working with. It's a battle the Cahiers decisively won and I don't think you'd find a serious critic at this point who entirely rejects their basic point. Nicholas Ray is one such auteur and his signature can supposedly be seen in everything from Rebel without a Cause to Wind Across the Everglades. As I laid out in my longer piece on the director, I'm not sold on Ray as a filmmaker with a consistent, readily identifiable style and citing him as an example in support of the theory seems to stretch the definition past the point of coherency. The 1957 Ray films Bitter Victory and Bigger than Life add a little credence to my notion that Truffaut's ideas on auteurism might be a little shakier than most would admit. 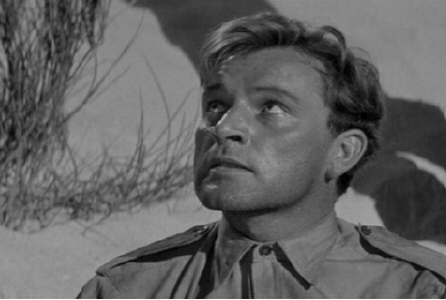 Bitter Victory is a gorgeous B&W war film that borrows liberally from Casablanca; it stars Richard Burton and Curd Jurgens as soldiers on a suicide mission behind enemy lines. The two soldiers are both in love with the same woman and their bleak missions gets all but derailed by their psychological one-up-manship. It has a memorably psychologically sharp script and Jurgens in particular delivers an understated, complex performance. Bigger than Life, on the other hand, is a candy-colored, cartoon-y, campy tale of a school-teacher with a heart condition who goes off dosage while on a miracle drug and becomes an unpredictable, manic lunatic. It's a silly Hollywood conception of how mental illness functions with James Mason in a caricatured performance than constantly lurches into laughable territory. The two films have virtually nothing in common stylistically, emotionally or philosophically aside from a general a taste for melodrama. But their approach to melodrama couldn't be more polarized: sly, nihilistic, quietly devastating in Bitter Victory; loud, ridiculous, over-the-top in Bigger than Life. One film is life-sized, the other bigger than life. (see page 4 for the answer as to which is which!) 1957 couldn't be a worse year to argue for Nicholas Ray as an auteur. Typical for the aggressively iconoclastic Godard and Truffaut, they don't shy away from their position just because it has obvious problems. If anything, the filmmakers increase their resolve to stick to their guns: in addition to promoting Ray in a year that his work actively undermines the notion of auteurism, they also highlight other films little-loved by even fans of their directors like Lang's Beyond a Reasonable Doubt, Hitchcock's The Wrong Man and Chaplin's A King in New York. If there's another obvious hiccup in the auteur theory, it's that: because a filmmaker is theoretically stamping his signature on every work he produces, even obviously problematic films like Bigger than Life and A King in New York should theoretically have something to recommend them. I think it's telling that Truffaut goes to bat for the weird, less artistically accomplished Bigger than Life - it's a piece of his argument that auteurism can over-ride surface quality and it goes hand-in-hand with the further notion that in cinema bad is not what critics have said it is and good can be found in less apparent settings. Godard simply picks the better film - and it's not a crazy idea that Bitter Victory was the best film of 1957. In the larger cultural context of1957, Bitter Victory would have been just outré enough to keep Godard's credibility intact, but not as strange as adovcating on behalf of something like the James Mason child-bullying heart-condition freakout that is Bigger than Life. As far as either film's influence on their own work, again, the influence isn't readily apparent. As much as Truffaut loved Nicholas Ray, they don't have a whole lot in common. The best general comparison could be to say that they both have a proclivity towards melodrama. However, I would say that Truffaut more or less does regular old "drama," while Nicholas Ray's melodramas are really excessively melodramatic even by the standards of the genre and that contorting definitions to fit a theme doesn't do anybody any good. I guess that the silly, violent climax that mars The Soft Skin, resembles the cheesy, out-of-the-blue Mason-on-Mathau fight at the end of Bigger than Life, so maybe Truffaut just learned a bad lesson or two from Ray. Godard stole some bits directly from Bitter Victory, which confirms his tendency towards "homage" and his loose definition of the word as "stealing stuff that I like and putting it in my own films." But again, it would be really stretching it to go any farther and say something like "Well, Godard did make a B&W war film (Les Carbiniers.)" Also, Les Carbiniers was made in homage to Jean Vigo, but I'll just have to take Godard's word for it because while Les Carbiniers reminds me of L'Atalante more than it does Bitter Victory, it doesn't remind me of either film, really.